Project 0 is an idea for a project generated by the space itself and by the people who inhabit it. Project 0 is an imaginary filter for passing images, concepts, and meanings. Project 0 aims to re-activate the public imagination about the space by exploring and non-intrusively commenting on urban space, on stereotypes about living and dwelling, and on whether these make a neighbourhood visible or invisible. Project 0 is a “non-object,” “nonmaterial” filter composed of fragments with no remainder. The implementation of Project 0 is closely tied to the process of setting up a platform for generating content and dialogue. 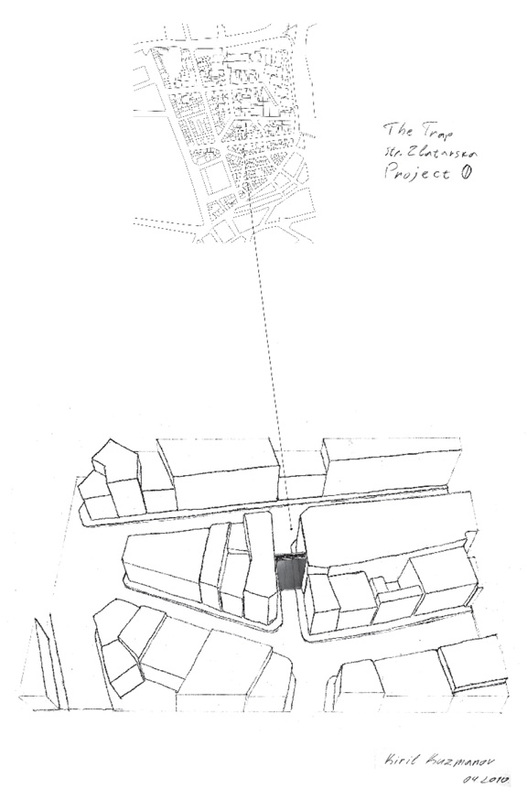 It aims at enhancing the range of possible subjects and issues by including all involved in the project – partners, groups and individuals who have placed an order for a fragment, the inhabitants of Zlatarska Street in the Kapana (The Trap) Quarter, those who are interested in the project, as well as people from different disciplines etc. The development of the platform closely follows the process of how the fragments are being stated, creating a critical and public environment for its realization and understanding of the place. The 50 fragments of the project are forming a bilateral mirror wall, which perpendicularly intersects Zlatarska Street in Plovdiv’s quarter Kapana (The Trap). The fragments precisely follow the outline of the building facades on both sides of the street. Each of the two sides is composed of 25 fragments – 12 of which are 204×102 cm and 13 pieces with variable dimensions, 50 fragments altogether with an individual number and position. The fragments contain the proportional amount of the materials used while their value is calculated based on the expenses for crafting, assembling and dismantling, with no other added value. In the fixed period: June 2010 – May 2013 these fragments were stated by different people and groups and were consequently installed for a period of 10 days (7-17 of June 2014) on Zlatarska Street. After their dismantling, each person or group received their respective fragment, and the project continues to exist in different parts of the world, referring back to the place and the generated process.